The club now has 2 apiaries. Members maintain about 20 hives in total at the 2 sites, providing an opportunity for all who wish to get involved with practical beekeeping to do so under the careful supervision of experienced apiary managers. Club meetings are held most Saturday afternoons throughout the year at one or the other apiary, whilst training courses or particular projects are often fitted in at the alternative site. Full details are always shown on the ‘programme of events’ web page. 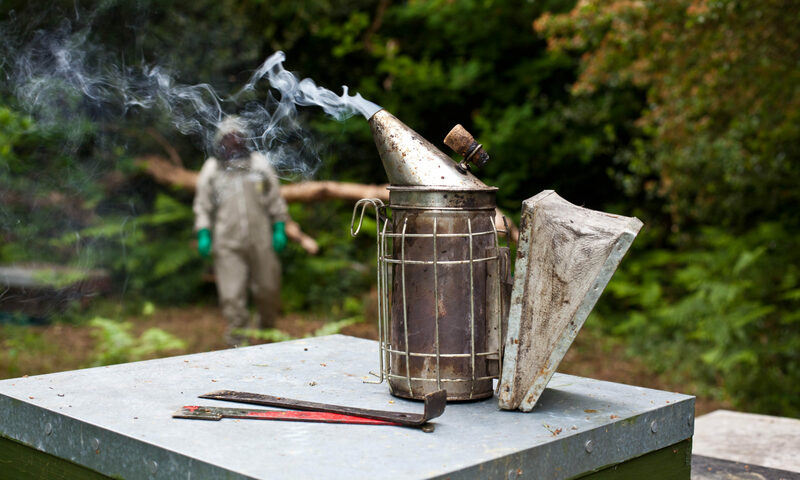 The Ruxley apiary at Honeydale Farm has been the home of the club for many years, and provides a secluded site away from homes or buildings, ideal for all types of beekeeping activities. However, space is quite limited within the apiary hedges and the rapid growth in club membership since 2007 made it necessary to expand on another site. There is also no easy vehicular access to the Ruxley apiary, so we have often been constrained by bad weather. The Baldwyns Park apiary is in the grounds of the Baldwyns Park Freeholders Association Social club (BFA), where there are excellent all weather parking facilities, a modern club house with kitchen and a bar, and brick built secure storage where all the club’s valuable equipment is stored. Lectures and social gatherings are held here, in addition to the Saturday afternoon beekeeping meetings – most of our members have also joined the Baldwyns Freeholders Social club since we made arrangements to set up the apiary in 2008, and you need to be a member of BFA to enter the site. Baldwyns Park honey is always on sale in the bar. Development of the apiary, with hedge planting and constructing a new workshop/shed close to the hives, has been a major task for members new and old. Detailed locations for the 2 apiaries are given on the ‘where to find us’ web page. Anyone interested in our activities and potential new members are always very welcome to come to either site, but please note that both sites are locked when not in use. Phoning one of the club officials a few days in advance to check what might be going on is a good idea.